The year was 1621 and after struggling to adapt to life in the new world, the pilgrims finally had a bountiful harvest worthy of an epic feast. It was so epic that it became the forerunner of an annual glutinous celebration where American’s and Canadian’s alike stuff themselves silly with delicious holiday fare. Now, how “traditional” is this special cuisine associated with the bountiful celebration of 1621? Not very. Every third Thursday of November hundreds of thousands of people (90% of the US population) eat Turkey, mashed potatoes, stuffing, cranberry sauce, and pumpkin pie; none of which were eaten at that inaugural celebration in 1621. Instead, the pilgrims ate Duck and venison (compliments of the Wampanoag Indian tribe), seafood, cabbage, onions, corn, and squash. All of which I’m sure where delicious in their time, but I for one prefer our modern adaptation of the feast. That’s right, you guessed it. It’s that time of year again, so bring out your bibs and dust off your finest utensils because Thanksgiving is just around the corner. Now, if you were wondering where in this fine country one might find a banquet of epic proportions that would put the first Thanksgiving to shame, look no farther then Seoul’s very own Grand Hilton. Known for putting on grandiose celebrations (this year’s Oktoberfest may have been the finest outside of Munich), the Grand Hilton will be sure to put a smile on everyone’s bellies. They’ll even role you out the front door at the end. 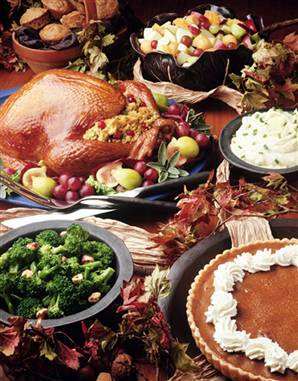 The feast will have all the “traditional” Thanksgiving fair including Turkey, mashed potatoes, stuffing, cranberry sauce, apple strudel, pumpkin pie, and even sweet potato casserole along with numerous other dishes prepared by the Grand Hilton’s award winning chef’s with their own personal flair. And since we are in Korea, some traditional Chuseok (the Korean equivalent of Thanksgiving) food will be served as well. The meal will also include a complimentary glass of champagne and red wine to boot. But wait, the fun continues. The Grand Hilton won’t only be celebrating Thanksgiving on the 24th, they will also be celebrating the beginning of the Christmas season with their tree lighting ceremony and Christmas carolers; both the Songjuk Orphanage Choir and the Grand Hilton Carol Team will be singing their little heart’s out as the grounds are turned into a Christmas wonderland. So be sure to come out and warm your knickers as we put the buckles of our belts to the ultimate test. Enjoy the mass consumption of delicious food, and sing holiday classics as we are mesmerized by the alluring glow of a Christmas tree. Now don’t fret if you are unable to attend, the Grand Hilton will also be offering take away Turkeys at their Alpine Deli. All you need to do is place your order by phone two days in advance (02-2287-8274).